Churchill was 79 when she wrote the play. In it the characters are over 70. It’s wonderful because we see fabulous actors that we don’t very often get to see in ‘big’ parts any more. Three longtime friends – Sally (Maria Vacratsis), Vi (Brenda Robins), and Lena (Kyra Harper) – spend summer afternoons in Sally’s garden, talking and drinking tea. They’re joined by Mrs Jarrett (Clare Coulter), an acquaintance who was passing one day, noticed them through an open gate, came in, and keeps coming back. The friends chat about fairly inconsequential things; what used to be where the antique shop is now, old currency and new currency, their children, their nieces and nephews. Mrs. Jarrett is curious and asks them questions about their lives – nice for the audience because we get to learn their back stories. One of the things I loved about the show was that the three women really seemed like friends, finishing each others sentences, telling each other what to do, sometimes being a bit snippy but leaping to each others defense. While she was telling her story the friends were moving around quietly, putting sweaters and shawls on different chairs and then sitting in a different chair than they had been. It was a clever way to signify a new day, sitting in a new chair. I really liked the stripped down look of Director Jennifer Tarver’s staging. The stage itself was in between the audience – think high school gym with bleachers on either side of the gym. The ‘bleachers’ are the audience and the ‘gym floor’ is the stage. Teresa Przybylski’s set echoed the openness. Above the stage white paper cut-outs of leaves suggested a big tree and underneath a place for the women to sit in the shade. There were four mismatched chairs, the kind that you’d relegate to the garden, on the stage. My friend Pat and I really enjoyed Escaped Alone but we both felt that we weren’t sure we understood it. As I thought about it I think it’s because there’s really no plot. There is some character development in that we learn about the three friends. We don’t learn anything about Mrs. Jarrett. There are certainly things to think about in her monologues. I think that every one is going to take what they want from the play. I loved the writing, the acting, and the look of the production. 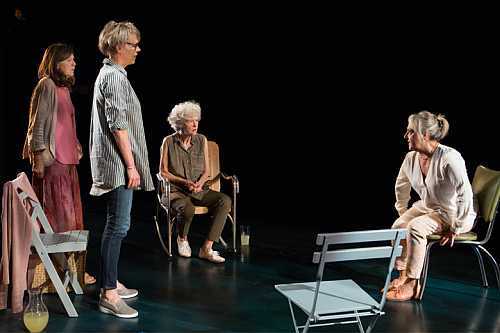 My favourite thing in the play was the friendship between the three women. Friendship is different when you’re old. It’s less frantic. You still laugh together and cry together and support each other through tough times but it tends to be quieter when you’re together. You can still break into a sweet version of Do Wah Ditty though. Previous PostReview: Will You Be My Friend (Green Light Arts)Next PostPlaylistings for the Week of November 5th, 2018.